Error restoring the object . Original exception: Error during temporary files deletion. Please delete the folder D:\espn-cms2\CMS\App_Data\CMSTemp\ImportExport\ manually. After deleting this directory, the "Import Site" and "Export" pages now load. Navigate to other pages and allow your site to recompile. Once you've been around a few pages, navigate back there and press CTRL+F5 to reload the page. Should resolve your issue. If not, check the event logs in Kentico as well as the server event logs. So I have done the above formenionted and no luck. One other thing I notice is both the "Import site" and "Export" have blank screens. "New Site Wizard" and "View export history" do have screens that display. Another thing to try is to hit the System page to clear the cache on the server / restart the application. In some rare circumstances I have seen where you have to go directly to the page to get it to load (/CMSModules/System/System.aspx). 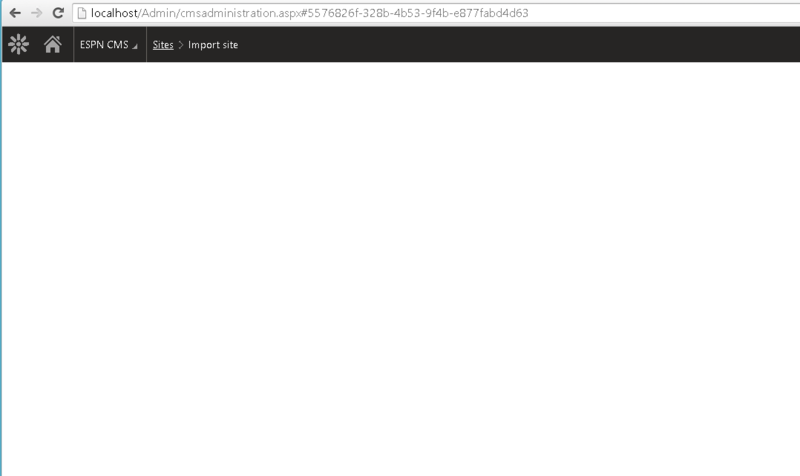 Unfortunately when I go to /CMSModules/ImportExport/Pages/ImportSite.aspx all I see is a blank page. I see "export site" is the title, and when I read the market up it seems to be putting the title in there, so its doing something... hmm not sure what do next.